"I have NEVER had anything better. It is by far the BEST I have ever had." The apple doesn't fall far from the tree with this cake! Our customers love this cake and it also makes a great gift for giving and entertaining. A best selling cake since 1995! CoffeeCakes.com Apple Walnut Coffee Cake uses a traditional rich sour cream coffeecake batter enriched with two layers of fresh granny smith apples. The coffee cake is then slow-baked in order to caramelize the apples. The CoffeeCakes.com Apple Walnut Coffee Cake is trans fat free and does not contain any artificial coloring, artificial flavoring or preservatives! This one-pound twelve-ounce coffeecake serves approximately 10 - 12 and can be frozen up to four months. We're delighted to offer CoffeeCakes.com Apple Walnut Coffee Cake in both regular-size and large-size cakes! 20 Ounce Ceramic Travel Mug. Microwavable and dishwasher safe. Includes plastic lid insert to help keep your beverage warm and prevent splashes. Made-in-the-USA Ceramic commuter mug � 20 ounces � in classic white. Made in USA, Lead and Cadmium Free. Decor Bon Bon tall pedestal cake stand. This antique white Victorian style cake stand has scalloped edges and a decorative tall pedestal. Approximately 8" tall and 10" diameter cake stand is a gorgeous way to present any cake. 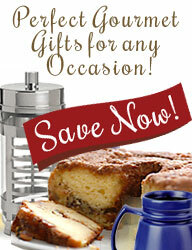 Presented in a decorative gift box that makes a great gift for any baker or cake lover! Also comes in a tasteful Strawberry-Creme 1930's Style Pink!